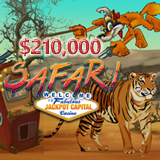 This summer, Jackpot Capital Casino players are competing with each other for $210,000 in Safari casino bonuses. There's $30,000 in weekly bonuses for frequent players and any one can win in random draws for another $5000 every week. The prize-filled African Safari continues until July 6th. You'll automatically earn points when you play casino games at Jackpot Capital. You'll be listed on a scoreboard alongside other frequent players. Maximum bonuses for the top players have been increased to $800 each for this event. As usual though, even if you play less often you can win random draws on Fridays. Frequent players win up to $800 weekly. Contest details and current points scoreboard rankings are at https://promotions.jackpotcapital.eu/safari. Jackpot Capital Casino offers hundreds of games from Realtime Gaming (RTG). The latest is the new Cash Bandits 2, now in its download, instant play and mobile casinos. Three Scatters trigger its Vault feature where players try to break into a safe full of prizes to win up to 100 free spins with up to 5X multiplier.